New Zealand’s lush landscapes are shaped by its oceans and waterways. They infuse its dazzling array of fresh produce with unique flavours and support wonderful wildlife. The Cook Strait, Marlborough Sounds and a short ferry ride are all that separate the North and South Islands. The trip – surely one of the most scenic ferry routes in the world – takes around three hours. But thanks to dramatic mountains soaring skywards like jagged teeth, it feels much faster. The Queen Charlotte Sound stretches out before us and, as we float by a Greenshell mussel farm, Matt shares some fisherman’s tales: ”Once, when I was fishing with my grandfather, we ran out of bait and he ripped off a piece of his flannel shirt, dipped it in some bait residue and pulled up a big blue cod. True story!” Greenshell mussels – also known as green-lipped mussels – are one of New Zealand’s biggest seafood exports and this is the only place in the world where they can be harvested live and fresh. The water quality and abundance of plankton mean these mussel farms are also among the best spots in the country for fishing, especially if you’re a fan of yellow-eye mullet and blue cod. Alongside palm-sized oysters cooked in just a dash of oil – tasting as fresh as the water they come from – we feast on 7kg fillets of Regal salmon and Cloudy Bay clams soaked in wine and garlic, flinging leftover shells into the water for the cod to munch on. Approaching the Bay of Many Coves – a secluded five-star lodge teetering on a hillside with 120 acres of emerald parkland as its backdrop – is breathtaking. Only accessible by boat, lacking phone signal, and with a waterfall and stream as its main water source, this is a place for silence and solitude. But for those who prefer their feet firmly on dry land, there are several tramping trails marked out on the hotel’s grounds: the short Glow-worm Hike, the lofty Lookout Walk and the 30-minute Waterfall Loop. And there are dozens of bird species to spot here too, from cormorants to flightless wekas or tufted tui. But while its 40°C hot tub, heated outdoor pool and opulent one-, two- and three-bedroom suites all exude relaxation, there’s more to this resort than just getting off the grid. It’s pure luxury, and we’re served a delectable five-course tasting menu with wine pairing for dinner. Afterwards, I sit on my balcony and soak in the sounds, contemplating life on the water. The next morning we wake to birdsong and a glorious sunrise – not to mention a cooked breakfast, served alfresco on the terrace – then sail back to Picton, before venturing inland. Fromm produces around 80,000 bottles a year, and we sample some of its finest – a couple of different Pinot Noirs, a Pinot Gris and a Riesling – while learning all about the best ways to taste wine: pay close attention to the colour, smell and whether the grapes taste bitter, sour, salty or sweet. This is just one of the many vineyards we visit across the neighbouring Marlborough and Nelson Tasman wine regions – famous for their intensely flavoured Sauvignon Blanc and Chardonnay, respectively. And while Marlborough produces around 70-75% of New Zealand’s wine compared to Nelson’s more boutique 3%, Nelson is just as crucial to the industry. In fact, as the largest port in the South Island, it ships all of the region’s wine – while also being the biggest fishing port in Australasia. “It’s just a magical place,” says Cameron Woods from Tasteology, the cellar door and café at the Kahurangi Estate. “We’re surrounded by all this beauty and diversity. And the amount of fresh produce that’s made here – we’ve got olive growers, cheesemakers, winemakers, mushroom growers – it’s just phenomenal.” Nelson is the only place in New Zealand that grows hops. In fact, the quality is so good that they get exported to Germany and transformed into some of its most beloved beers. 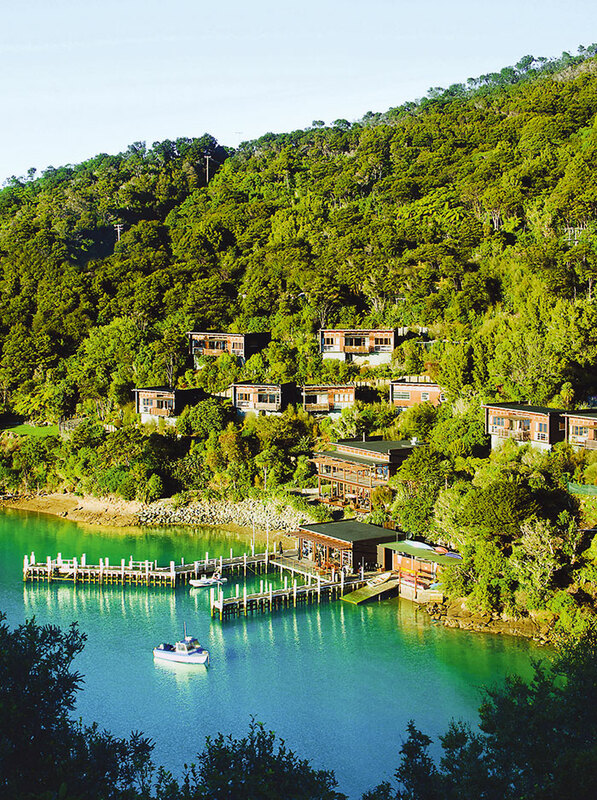 And we’re just a stone’s throw from Abel Tasman, the country’s smallest national park. What this region lacks in size, it makes up for in natural beauty. 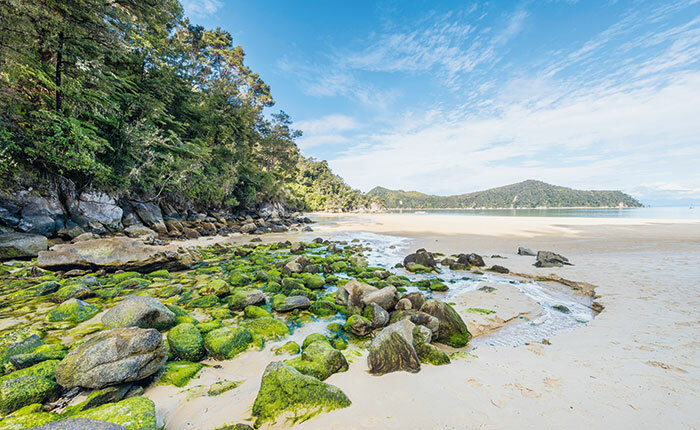 The coastal track of the same name promises dense forest, golden beaches and rugged cliffs, with the opportunity to see little blue penguins, seals and schools of bottlenose dolphins cruising by. From the town of Kaiteriteri, we travel by boat to Tonga Beach and spend two blissful days here. We sip wine and admire the wetlands of our hotel – Awaroa Lodge – hike to the top of hills for views across swirling sandy bays, kayak from the beach and sink our toes into the squeaky-soft sand. As our Journey comes to an end I reflect that no matter what type of wine or food we’ve tried, it all comes back to one thing: the water. 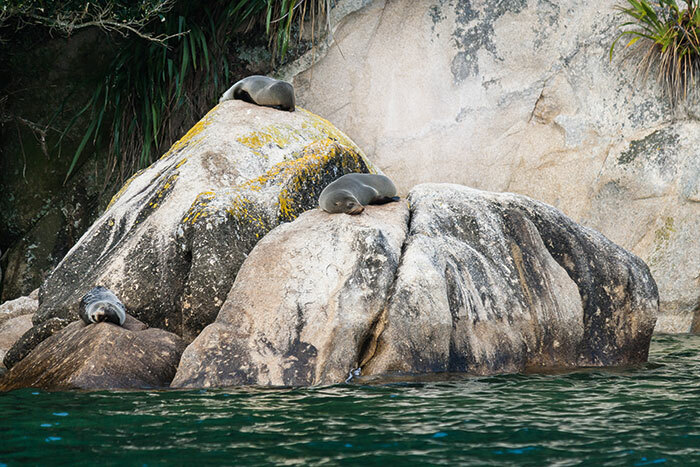 It’s as crucial to the grapes as it is to the fur seals we’d seen sunbathing at the ocean’s edge and in Abel Tasman. The food, the wildlife, the landscapes, the adventures – none of it would be possible without New Zealand’s 50 major rivers, 770 lakes and surrounding seas. The vision of those seals, not to mention spotting dusky dolphins, albatross and a huge flock of shearwaters on a Kaikoura boat ride, is still clear in my mind. That, and the flavour of some of the most delicious Sauvignon Blanc to ever grace my glass. Want to taste your own way around New Zealand's landscapes? 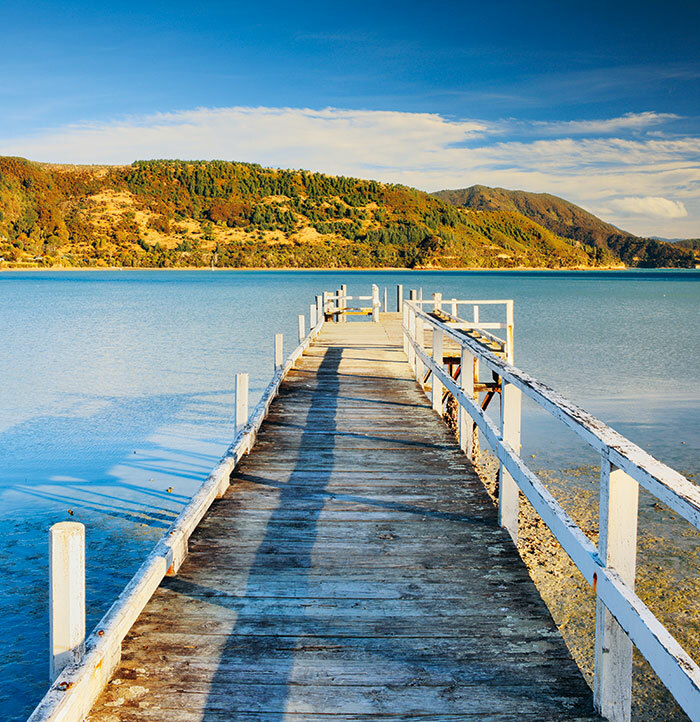 Speak to one of our Travel Experts about our New Zealand Journeys. Call 0800 587 0058 or visit us in-store.